I realize there's a lot of art styles I haven't made a go of... So I need some help here. I suppose I'll just get started. But anything I haven't tried yet(setting aside realism) I'd like to make a go of. So, here's fauvism. It wasn't a very long lasting style, but it emphasized "painterly qualities and strong colour over the representational or realistic values." This doesn't mean anything and the colors are the strongest. 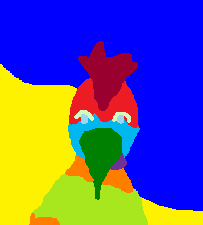 I just went with some brigh powerful colors and build a chicken with 'em. Next style.